Kendall Excilon Drain and I.V. 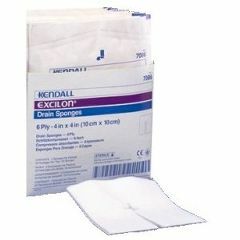 Sponges Sterile 4" x 4"
EXCILON AMD Antimicrobial I.V. Sponges 2 x 2"
EXCILON Non-Woven All-Purpose Sponge - Sterile - 4 x 4"
I just ordered a product from your website yesterday and just minutes ago received it at my door! I am very impressed at how easy it was to order yesterday and your speedy response. Thank you for your great service. I look forward to ordering from you in the future. Craig: I just got my Thumper in perfect order, early. I've left a glowing review for you, because as a newly published author of "Be A Shortcut: The Secret Fast Track to Business Success", I understand how important those reviews are. Thanks for a stellar job.